BRISBANE, Queensland (January 5, 2019) – Donny Schatz added to his illustrious rèsumè Saturday night at Archerfield Speedway as he charged to his ninth World Series Australian Sprintcar Open win. Schatz rolled off on the outside of the front row for the 50-lap, $20,000-to-win main event with fellow World of Outlaws competitor, Logan Schuchart, to his inside on the pole. Schuchart took the lead at the drop of the green flag as Schatz settled into second, while Kerry Madsen ran in the third spot. Schatz patiently rode in the runner-up position until he placed a bid for the lead on lap 21. The 10-time World of Outlaws champion successfully maneuvered past Schuchart to take the point and raced the remaining 29 laps relatively unchallenged en route to capturing the checkered flag. A late race caution reset the field and put Schuchart and Madsen within striking distance of Schatz on the restart, but the Fargo driver was able to fend off their charges as the race resumed. A turning point in the night for Schatz came in his final heat. The driver of the Raw Metal Corp / American Racer No. 15 cruised from the fifth row to win the 10-lap heat, raising him to the provisional number one qualifying spot. Schuchart would go on to claim the pole position by besting Schatz in the Gold Shootout, relegating him to the outside of the front row for the start of the feature. The feature win for Schatz was his 26th with the World Series Sprintcars, which breaks a tie with the late Jason Johnson for third on the all-time wins list. Ahead on the wins list is Brooke Tatnell and Max Dumesny with 77 and 53 victories, respectively. Schatz’s six-race Australia tour will come to a close on Wednesday, January 9th at Archerfield with the Word Series Sprintcars. When Donny wins, YOU WIN! 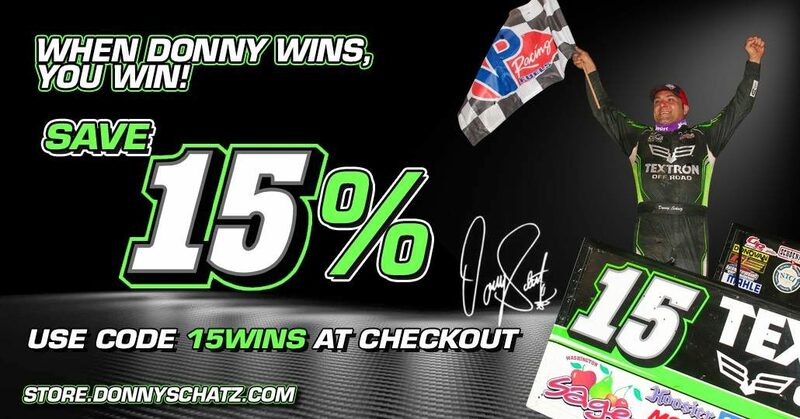 Save 15% at store.donnyschatz.com through Monday, January 7th! 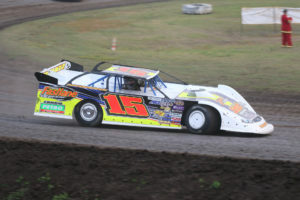 BRISBANE, Queensland (January 1, 2019) – Donny Schatz cruised to his second main event win at Ausdeck Patios Archerfield Speedway on New Years Day. Schatz began the evening by setting fast time in time trials and qualifying for the outside front row starting position for the feature. The 10-time and defending World of Outlaws Craftsman Sprint Car champion led all 35 trips around the semi-banked quarter-mile clay oval en route to his second triumph in three starts. Schatz won in his first night of action at Archerfield Speedway on December 26th. In his second outing on December 29th, the Fargo driver was running second when he was involved in an incident which resulted in the Raw Metal Corp / American Racer No. 15 J&J getting upside down and ending his night. Schatz’s six-race swing in Australia will close with three World Series Sprint Car events at Archerfield Speedway on January 4th, 5th and 9th. When Donny wins, YOU WIN! 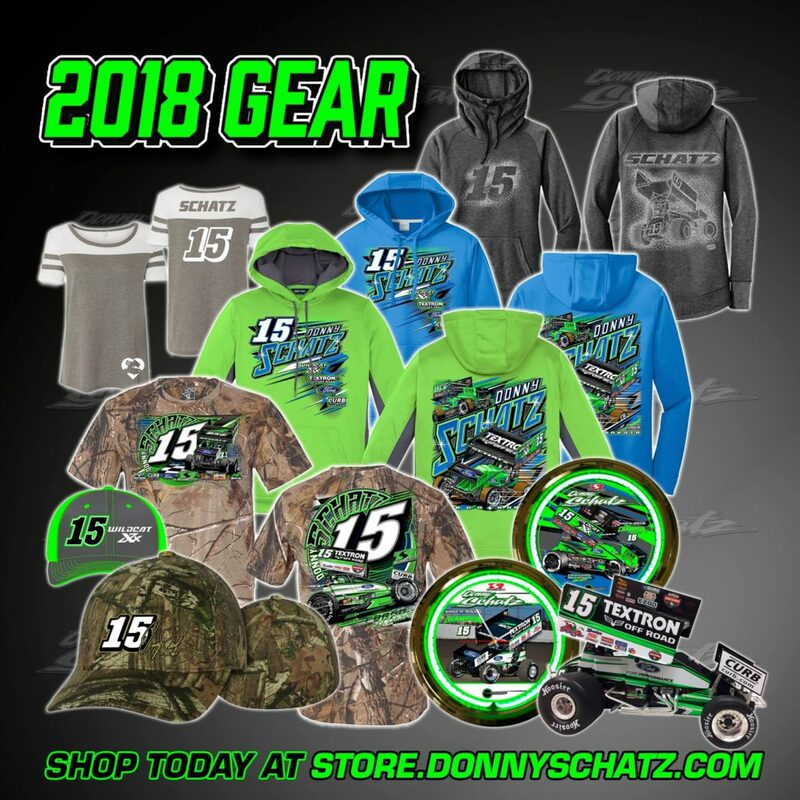 Save 15% at store.donnyschatz.com through Thursday, January 3rd! BRISBANE, Queensland – Donny Schatz opened his six-race Australian tour with a win Wednesday night at Archerfield Speedway. The win marks the Fargo driver’s 27th Sprint Car win of the 2018 season. Schatz has won at least one race in Australia every year since 1999. 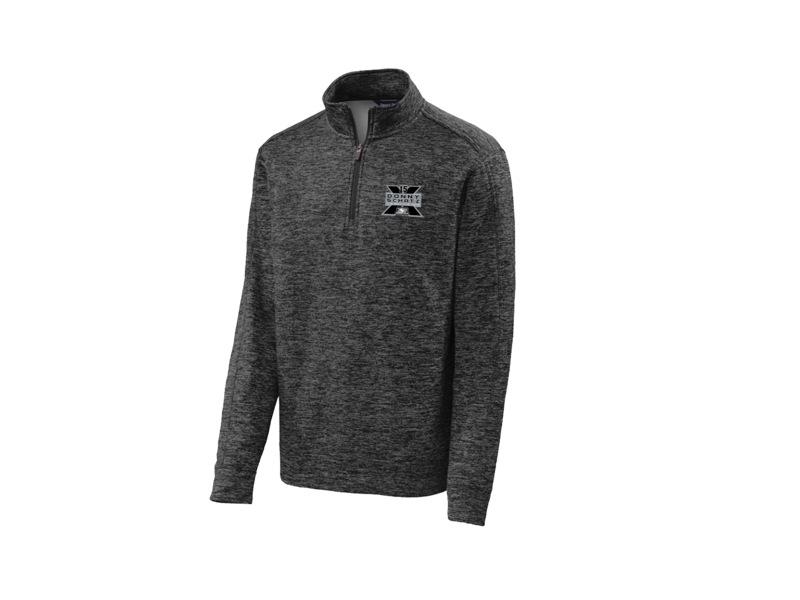 FARGO, N.D. – The 2018 World of Outlaws Craftsman Sprint Car Series season was another banner year for Donny Schatz and the Tony Stewart Racing team. Schatz, a native of Minot, N.D. who resides in Fargo, recorded his 10th series championship over the weekend at the Dirt Track at Charlotte Motor Speedway. The Outlaws’ season came to an end in no better fashion for Schatz on Saturday night, as he drove from the 10th starting position to win his 22nd main event of the season. The win for Schatz was his 12th at the speedway and 283rd of his career (third-most all-time). The season began with Schatz winning the second event of the 91-race season. In doing so, he took command of the World of Outlaws point lead. Once atop the standings, Schatz did not relinquish the point lead all season long. Schatz’s 10th title puts him in elite company. He is just the second driver to record double-digit Outlaw championships – a feat only Steve Kinser had previously accomplished. Schatz is still in the prime of his career at 41 years old, but he says Kinser’s record of 20 Outlaw championship is unreachable. 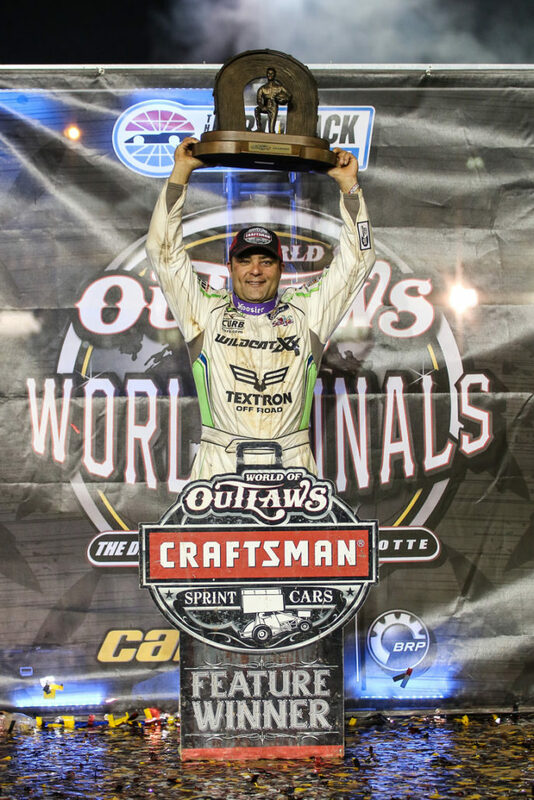 Donny Schatz celebrates his 10th WoO title. Zach Yost photo. The 2018 campaign was a grueling one for Schatz and his Tony Stewart Racing team. His crew chief, Ricky Warner, was sidelined with health issues early in the season and car chief, Steve [Scuba] Swenson, suffered a broken ankle out on the road. Still, Schatz continued winning races and remained atop the standings all season long. “It took a lot of adaptation from the entire crew. Being without Rick put Scuba in a more serious role as crew chief. When Rick came back, he wasn’t fully functional so that put a lot more stress on the other guys. Tony [Stewart] has always had great people. He will always have great people and we are very blessed that his guidance and leadership allowed us to stay in that championship position throughout all adversity,” said Schatz. It’s no coincidence that Schatz and Warner are the longest running driver/crew chief duo on the World of Outlaws tour and are the most decorated team over the last 10 years. Since coming together in 2005, Schatz and Warner have been nearly impossible to beat. The Tony Stewart Racing No. 15 was the only car on the World of Outlaws tour this season to be running at the end of all 71 completed events. Schatz admits part of that has to do with his driving style. He doesn’t play games on double-file restarts, which are the most treacherous part of a race for the 900 horsepower open-wheel machines. It also goes back to the dedicated crew that maintains the car. “People think we just throw new parts at it and that’s hardly the case,” said Schatz. “But what they do to maintain what they have, and how they maintain it, is so pristine.” The crew has a meticulous process going over every nut and bolt before each race and it’s something in which they take great pride. Schatz had several highlights throughout the season, including a 20-win season for the sixth consecutive year, a podium finish at the Knoxville (Iowa) Nationals for the 14th consecutive year, a season without a DNF (did not finish) for the third time in his career, wins at the Kings Royal at Eldora Speedway in Ohio, the Jackson (Minn.) Nationals, and locally at River Cities Speedway in Grand Forks and Red River Valley Speedway in West Fargo. However, it was the team’s tenacity during the summer months that stands out as the most memorable part of the season for Schatz. Despite the 2019 World of Outlaws season opener being under 90 days away already, Schatz won’t remain idle for very long this winter. The Fargo driver will make his annual trip to Australia to compete in a sprint car at Archerfield Speedway near Brisbane, Queensland on December 26th. It’s also possible Schatz will pilot his dirt late model at some bigger events down south over the Outlaws’ offseason. It was 25 years ago when Schatz strapped in behind the wheel of a sprint car at Red River Valley Speedway. He quickly began winning races locally, but nobody imagined that kid from Minot would land the top ride in all of sprint car racing, let alone win a World of Outlaws championship. Now, he’s won 10 of them and is considered one of the greatest of all time. Schatz continues to rewrite the history books each and every year and it doesn’t appear he will be slowing down any time soon.